The California Biodiversity Initiative is a seven part plan to protect California's biodiversity, focused especially on California's 6,500 native plant species. California has more native plant species than any other state in the U.S., and now Gov. Jerry Brown has taken historic steps to protect that biodiversity. In September, the governor signed two executive orders that connect climate change remediation with native plant preservation. He also unveiled a Biodiversity Initiative Roadmap, detailing a seven-part action plan to preserve California’s native plants and animals. A Sept. 7 executive order directs the California Department of Food and Agriculture (CDFA) and the Department of Fish and Wildlife (CDFW) to partner in protecting California’s native vegetation and animals while restoring and protecting habitat. It also establishes Sept. 7 as California Biodiversity Day. The Biodiversity Initiative Roadmap outlines scientific and educational approaches already in use – and proven to be effective — in California. 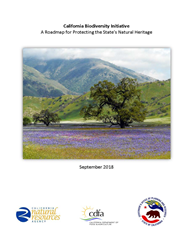 Specifically, the plan calls out the need to identify California’s important plant areas, map native plant communities, seedbank California’s flora, adopt native horticulture, and educate the public about biodiversity. Each of these areas of work align directly with long-running programs and projects that CNPS and partners have under way.